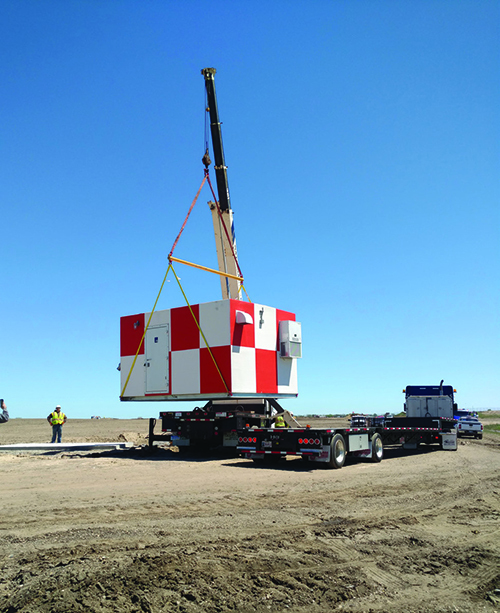 More than 15 years in the making, the project involved shifting and extending a 3,500-foot crosswind runway to 4,000 feet in length and relocating/building a new 5,350-foot main runway. The intersection of the two runways was moved approximately 500 feet north to create room for 1,000-foot-long runway safety areas for the main runway and 300-foot-long runway safety areas for the crosswind runway. The new design rotated the main runway about 10 degrees clockwise to maintain proper orientation for prevailing winds, while the updated crosswind runway kept its original orientation. The project also added a new parallel taxiway for each runway to ease congestion and make operations safer; new lighting systems for the taxiways and main runway; and roughly 16,500 linear feet of perimeter fencing. Engineering Consultant: Mead & Hunt Inc.
Runway Prime Contractor (Phase 1): M&M Excavating Co.
Asphalt Paving: Michigan Paving & Materials Co.
Electrical Subcontractor: J. Ranck Electric Inc.
Perimeter Fencing Contractor: D-K Fence Co.
Clearing/Grubbing Prime Contractor: Mead Bros. Excavating Inc.
Runway Prime Contractor (Phase 2): Hoffman Bros. Inc.
Electrical Subcontractor: Rauhorn Electric Inc. Landfill Disposal Consultant: Envirologic Technologies Inc.
Material Testing Services Subconsultant: Somat Engineering Inc.
Aeronautical Obstruction Survey Subconsultant: Quantum Spatial Inc.
Land Restoration Contractors: North Slope Inc., Diane Dukes Inc. Given its scope, the project required the cooperation of local, state and FAA officials. The project’s success underscores the importance of maintaining good relationships with such agencies, says Kent Maurer, who served as airport manager at JXN for 16 years and retired earlier this year. Jackson County contributed $6.5 million to the project, which covered most of the cost of relocating a county-owned landfill that stood just north of the old main runway. The FAA paid for 95% of other project costs, and the state and airport equally split the remaining 5%. The county’s willingness to pay for the landfill removal was important, because that portion of the project wasn’t eligible for federal funding. “It reflects the commitment of local government to the airport,” Maurer says. “In a lot of communities, a project like this would’ve been dead on arrival at that point. JXN is a general aviation airport located about 40 miles south of Lansing, 35 miles west of Ann Arbor and 65 miles east of Kalamazoo. It has 103 based aircraft, mostly privately owned planes, but also several corporate jets. It handles an average of about 42,000 operations annually. The new main runway is the same length as the old one, while the crosswind runway that was built about 10 years ago is 500 feet longer than its predecessor. The extra length enabled the airport to use the crosswind runway as a primary runway during the roughly six months it took to build the new main runway. As such, the airport was able to stay open during almost all of the construction. Juan Zapata, the new airport manager as of April, says the extra 500 feet of crosswind runway is significant to the airport and overall region. “As a regional airport, we handle a mixture of smaller airplanes, but we’re really interested in being able to accommodate more corporate aviation,” says Zapata. The need for recent improvements dates back to 1942, when the U.S. Army Corps of Engineers built the old runways during the early stages of World War II (and runway safety areas were not required). When the FAA started to mandate safety areas, JXN and hundreds of other airports around the country were exempt due to their lack of available space. The specific constraints at JXN were an airport road on the east end of the main runway and a railroad track on the west end. “There was basically no way to add any flat surface to the ends of the runway, absent building a brand-new one,” Maurer relates. Years ago, a string of aircraft overruns prompted the FAA to lift safety area exemptions nationwide, which forced airports like JXN to comply. If airport officials and project designers couldn’t find a way to add the required safety areas, JXN would have had to operate with a declared landing distance of 4,349 to create de facto safety areas on the existing primary runway. “That would’ve precluded many aircraft from using the runway,” Maurer explains. 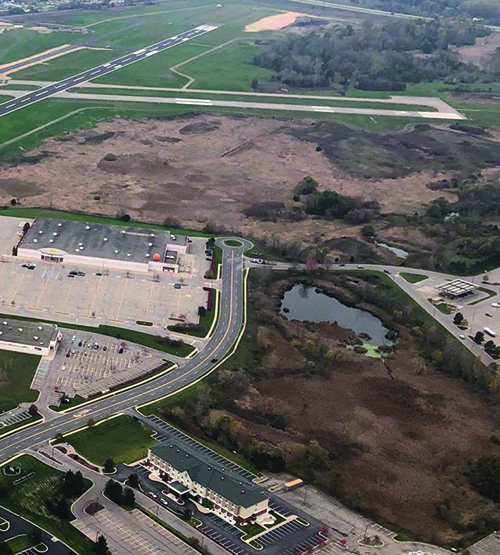 Planning for separate safety areas actually began in 2002, with the development of an airport layout plan. But the start of the project was delayed by the nationwide recession during the late 2000s and the time needed to remove the landfill and acquire 10 land parcels and 16 easements to cut down trees that posed safety hazards. The landfill was old, unlined and filled with unknown contents, so relocating it required extensive and time-consuming soil testing. “Plus, there were other competing projects in the state that were ahead of us and in a better position to start,” adds Maurer. The first phase focused on completing major earthwork on the west end of the project and relocating the landfill. It started in November 2015, stopped that December, resumed in March 2016 and finished that October. Refuse from the landfill was taken to other certified landfills in the region. In all, crews removed about 200,000 cubic yards (260,000 tons) of material—enough to fill 6,700 double-bottom gravel haulers. “Of course, you then have this big hole that requires you to haul in another 200,000 cubic yards of dirt to fill it,” Maurer says. “Plus, that end of runway was low, so it had to be brought up to grade.” Overall, the airport imported about 1 million cubic yards of soil. In fall 2014, the FAA decided to provide nearly $10 million in discretionary funds to JXN at one time rather than in two phases as airport officials anticipated. The mid-project funding windfall prompted a course-correction for the bidding process. During the second phase of the project, crews removed the old runway and built the new main runway and associated parallel taxiway. They also installed taxiway lighting and approach lighting for the runway. 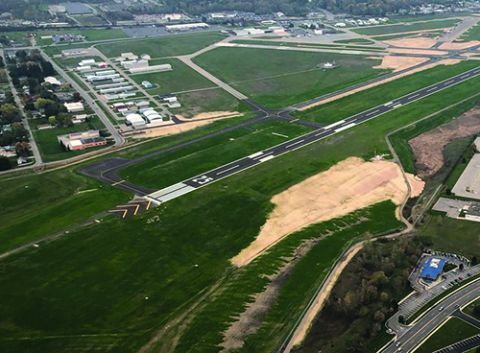 In an eco-friendly move, construction crews used roughly 25,000 cubic yards of pulverized asphalt and gravel debris from the old runway to build the sub-base for the new one. The last stage of the project involved building the intersection where the new taxiway meets the crosswind runway. The new runway opened in mid-September 2017, and the crosswind runway-taxiway intersection opened in November. Overall, the airport was closed for less than a week—four days while crews laid the asphalt pavement for the new main runway, and two other nights, while crews grooved the runway at the intersection. The new main runway and 10-year-old crosswind runway—both with grooved pavement—add to the reputation for safety that JXN’s existing control tower helped establish. Airport officials hope to leverage both features to attract more business aviation traffic. Moreover, the new runway location freed up space for more revenue-generating hangars. The airport currently owns 18 hangars—two corporate box hangars and 16 T-hangars for small private aircraft—and leases land for 65 hangars that are privately owned. All county-owned hangars are occupied, so the airport collects more rent payments than land-lease payments. Recent airfield improvements, however, are spurring requests from private pilots and corporations for more hangars. That’s prompting JXN officials to consider building more hangars or leasing land to aircraft operators so they can build their own. The airport would generate more revenue renting hangars than leasing land for privately owned hangars, but development is a pricey venture. Zapata estimates that building just one corporate hangar could easily cost $1 million and T-hangars to accommodate 10 smaller aircraft would cost about $750,000, with a 10- to 12-year payback period. Deliberations and cost-benefit analyses lie ahead, he says. The FAA originally proposed shortening the old runway to create safety areas and decrease project costs. But given the economic implications, JXN, county and state transportation officials all actively lobbied for a new runway. Their success reflects the importance of cooperative relationships with local government, Zapata notes. In retrospect, Maurer says bringing all the relevant stakeholders together and keeping them focused on the project was essential to project’s success. “They all have their own projects going, too,” he points out. “But the stars really aligned for this project …we had the right people in the right places.” Maurer specifically credits the county commissioners, county airport board and James Shotwell Jr., the long-reigning chairman of the Jackson County Board of Commissioners, as instrumental to the project’s success.